Over 30 Years of Experience Painting Portraits! Originally from the Cotswolds, Christine Varley has been working since 1987 as a professional Pet and Animal Portrait Artist. 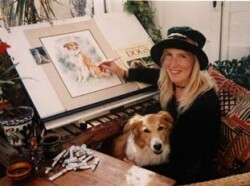 A career formed from two great passions …love love of dogs and other animals, with her talented creative skills, and is now recognized as one of the leading Artists in the UK. Whilst studying at Coventry University for her graphic design BA Hons degree, Christine painted pictures of the pretty Cotswold villages, selling them in the local galleries. In the late 1980s a publishing company, distributed reproductions of original pencil drawings & watercolour paintings which sold extensively across the UK. ” …It’s all in the eyes ” this is what the customers say and it is the secret to successful portrait painting. Christine has a reputation for capturing the very character of the animal she is painting, bursting with life …as it will jump right out of the picture! 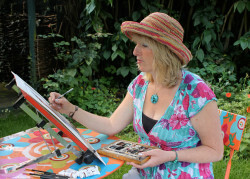 Painting from the garden studio in Derbyshire with dogs around her feet, the portraits have been sent all over the world. With selections from the vast portfolio of work, the latest range produced by Christine Varley Studio is called “WaggyDogz”. Featuring dog breed images and other animals as Greetings Cards, Mugs & Coasters, Keyrings, Cushions, Tote bags, Trivets Prints and Canvas Art. Images are also available on license or paintings can be especially commissioned for licensing purposes. Annual exhibitions over the years have been at Crufts Dog Show & most of the major Horse Trial Events, Spring Fair and other large trade shows. 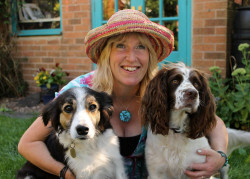 Some of the companies and charities who have worked with Christine include Central TV, Vanish, Tesco, Red Letter Days, Daily Express, Daily Mail, Dogs Trust, Kennel Club, The Brooke Guide Dogs for the Blind, Next, Harrods, iBeani, Evans of Lichfield.